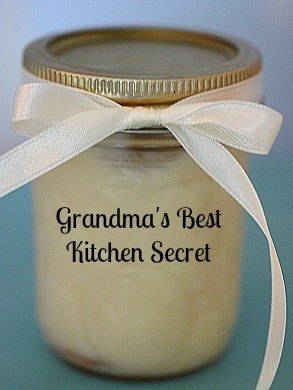 Going out on a limb and stating this is “Grandma’s Best Kept Kitchen Secret” may be a bit of a reach, but I am certain that most home cooks will agree with me, whether they want to or not. Over the last few years, bacon has gotten a really bad rap. Admittedly, my mother did not serve pork to us growing up, therefore, I didn’t really feed it to my family. Moving to the south introduced me to all the delicacies that I had been missing out on, and yes, pork was one of them. My food philosophy centers around balance and moderation, therefore, serving bacon to my family every once in awhile brings great joy to our culinary palette. Yes, I’ve shared how I cook bacon in the oven for ease, but one of my favorite things about bacon is all the many bacon grease uses. We’ve all had the problem of what to do with our bacon grease after we’ve made it in the skillet. Any time I use butter in a recipe, I ask myself if bacon grease would increase the flavor or be a unique option. Most often, I just put it solidified into a skillet, but if adding it to a recipe, I just reheat it in the microwave for 20-30 seconds and it is back to liquid form. Another benefit of bacon grease is that it keeps for up to six month in your fridge and nine months in the freezer. With the cost of butter and oil having sky rocketed, I appreciate having a flavorful option to consider. Most morning I make eggs for someone in the family. Quite often, instead of butter, I use a tiny teaspoon of bacon grease to coat the pan, and wow, does it make a difference. Fried eggs with bacon grease is definitely one of my favorite uses. This is the same for many of my egg recipes. I tiny bit goes a long way, and I LOVE it for all my easy breakfast skillet meals. It’s a must! Whether a bit is added to my Make Ahead Mashed Potatoes – Freezer Potatoe recipe, skillet breakfasts, Copy Cat Cracker Barrel Hash Brown Casserole, or Twice Bake Potatoes, a bit of bacon grease pops flavor into every bite. Bacon grease adds a delicious addition to many baked goods. The dynamic of sweet/salty is spot on. Bacon Grease can be substituted in baking for butter with a 1:1 ration. What’s a pot of pinto beans without a dab of bacon grease? Add it while it’s cooking and they will explode with additional flavor. Fry up your steaks in a bit of bacon grease for an amazing new marinated flavor. With the holidays approaching, Green Bean Casseroles will be on everyone’s mind. Just imagine how a dab of bacon grease will increase the flavor. I love green beans fresh and raw from the garden, but when your family desires cooked beans, using a little bit of bacon grease to cook them, rather than butter is a treat. I love a great spinach and hot bacon dressing, and yes, bacon grease is a fabulous way for home cooks to attempt to copy the restaurant flavor. With Thanksgiving approaching, gravies and sauces will be made in abundance. Consider swapping out the oil or butter base for some bacon grease. It makes a fabulous base, adding a smokey, savory depth to the flavor for those delicious sauces and gravies. Do you know the quick trick to stop your pans from overflowing? Drop a bit of oil into the pan when boiling pasta and it will not boil over. Yes, it’s a little kitchen wonder, but it works, and so bacon grease would work as well. I’m trying to incorporate more cast iron pans into my kitchen. A well seasoned pan will be a work horse for years, but it needs to be seasoned properly. I have done this by coating my pans completely with bacon grease. Hopefully, you’ll glean culinary ideas from that wonderful generation before us, who knew just how wonderful the many bacon grease uses were in our foods. Do you ever use Bacon Grease? What are some of your favorite Bacon Grease Uses? Oh yes, let’s definitely keep it in the fridge, but isn’t that something that they used it for years at room temperature? I think you are right. Generations were so much healthier than us. Pretty sure it’s because they just ate foods, all kinds of it, in its purest form. @Nana, My Mom had a little pot (it may have been a teapot) and she kept it beside the stove to put her grease in. It was left out all the time. We haven’t been reusing our bacon grease, but maybe we should. @Nana, I leave mine out by the stove and it is always good….use for all the ones you had listed except the baked goods and will try that! Ate enough food drowned in bacon grease while growing up. Probably why my cholesterol is sky high. The thought of using it today in cooking makes my arteries hurt! @Linda Dietz, Just thought you’d like to know that folks who follow a low-carb diet have found that bacon (and other fatty foods) actually bring down cholesterol levels. And the body naturally makes cholesterol too, so it could be a familial thing for you. People who eat high sugar (all forms, including starchy veggies) have higher cholesterol. Just an FYI from my experience. @Cherry Pie and Roses, I have heard that…but don’t really want to test it out. I do eat good fats & closely watch my intake of carbs etc. I do think it is genetic. My uncle died of a stroke @49 & a few years later, my father had a stroke that left him paralyzed for the rest of his life. In Heaven, I will be able to eat bacon! @Linda Dietz, It wouldn’t take long to evaluate that, Linda. I’ve moderated LowCarb message boards where people have tested the theory and made the decision within 6-8 weeks. The best way is to get new blood work and firm numbers before one begins, adhere to a low-carb plan, and have blood drawn again a couple of months later. Just a thought (I’m a little rabid about it…). Jen, I keep a container of bacon grease in my fridge, too. I love it in eggs and for making gravy! I love bacon grease.. some foods just taste so blah without it. I use it in all of my greens.. spinach, chard, mustard, kale.. etc.. German Potato salad is another favorite use. I use it most of the time when I need a tiny bit of grease/oil for something. I also use a little bit in my quiches. Yum. I love a good bacon, tomato & swiss crustless quiche. I keep a mason jar of it next to my stove & I have a much larger coffee tub that I keep more in.. not that Im likely to run out.. but I’ve got plenty. Btw.. my cholesterol is amazing according to every doctor & dietician who has ever seen my numbers. My total ch is under 200 most of the time, and my HDL is high & my LDL is low. My triglicerides are extremely low & they are amazed when I tell them I eat wisely, not eating many or any man-made foods. I use real whole butter, I use bacon grease, I eat a lot of fruits & veggies, & I eat MEAT and viscera.. all kinds, eshewing none except what I dont like. (tilapia in particular). The only thing I really try to keep out of my diet is grains.. with the exception of oats. Personally, I believe that meats & other healthy oils that got man-kind to where it is today has been vilified by entities with a political bent with financial gain in mind instead of the health & well being of our country. Science is now backing up the “old ways” of many aspects of food & lifestyles that we were taught in the late 70s & early 80s were “bad” for us. I LOVE this response. High five-ing your bacon grease soap box. LOVE IT! And that is so interesting to know about room temperature. There has to be some scientific reason for it not going bad. I wonder if it’s the same principal for when they salted meats in days of old. Maybe the high sodium content? I echo Kim’s comment. We eat real food at our house: butter, grass-fed meats, organic fruits and veggies. We avoid wheat-whole grain or not, it is not the wheat of our past. The bacon grease is in a pint mason jar at the back of the stove-like coconut oil, no refrigeration necessary. @KimH, I think you are eating and thinking the right way. If you think about the timeline, they introduced all the manmade or man designed oils, margarines and shortenings and it was what 20 years later that the cholesterol became such an issue. I believe that lard, bacon grease, real butter and olive oil are the best bets for having good cholesterol levels. We eat bacon and eggs on a very regular basis 🙂 and bake with real butter and have good cholesterol levels. Just a side note, years ago, my aunt went on a no low fat diet, she had not really had that much progress with her diet. Then her new husband said he wasn’t going for it, give him real food. She lost 15 lbs and was eating! She was just stuffing herself with the nofat stuff and never satisfied so she ate more. Real, basic food is the way to go! @KimH, Hear! Hear! I have the same results cholesterol and triglyceride wise. And my husband’s endocrinologist declared him cured of diabetes all the while that he ate bacon, cheese, real butter, mayonnaise, just simply cutting out sugar and starchy foods. BTW.. I never refrigerate mine and never have. Its never gone rancid or gotten mold or any other funky stuff on it either. Dont really know why, but it is what it is. I agree, moderation in everything (plus, many our parents/grandparents were doing hard physical farm labor from sunup to sundown, and needed all the calories they could consume…they just burned it all off!) I was raised, in the South, in a household where bacon grease was kept at room temp and added to many dishes. That’s how I learned to cook, so when I was first on my own, I did the same. Over the years I’ve changed my cooking and eating habits, so I very seldom fry anything or use bacon grase anymore. Having said that, a very thin coating of bacon grease on potatoes before baking them makes the skin nice and crisp. Mmmmmm. I love this! I always felt sad pouring out my bacon grease. I recently read an article in the newspaper that said bacon grease is clogging our water systems. They talk about how people are pouring it down their kitchen sinks and how it is causing issues when it solidifies. It talks about the proper way of disposing. So, by saving it, you are helping the environment! I use bacon grease all the time – I wonder if the reason it keeps at room temp (which I don’t do) is because the meat is cured already? I also keep my chicken fat when I skim it off broth and replace it for butter when I’m sauteing veggies for a chicken dish or sometimes will sub 1/2 of it for butter if I’m making a white sauce for a chicken dish. It doesn’t add a ton of flavor like bacon grease does but, like you said, with the cost of butter, it’s free and something I’d be throwing out anyways. @Mrs. K, Just recently I was thinking that I really should keep my chicken fat and use it for such things. Your comment confirmed that I really need to do this. We love using bacon grease for all sorts of things and I can’t believe anyone would actually throw it out! 🙂 One of the things we sometimes use it for is to “butter” bread when we make grilled sandwiches. Gives them the most delectable flavor! I didn’t eat pork until I was an adult also. All those years without bacon brings a tear to my eye. We always have a jar of bacon grease in the fridge too. It’s great when we make fried rice. My husband even made a bacon grease candle. You know for emergencies. I love the everything in moderation idea. That’s what we try to do, also. I’m not sure why bacon grease doesn’t go bad but once on a field trip to a pioneer farm I remember the guide saying that meat would be put into a barrel full of bacon grease and that would keep it from going bad. I tried googling this but came up empty handed. My grandmother also ate bacon and had a grease pot on her counter. She lived to be 95. But I don’t think it’s because she at bacon or used bacon grease. I think it’s because she ate real food and led an active lifestyle. (She rebuilt portions of her fence at 85!) I don’t remember ever seeing packaged food at her house. I too have a cute little container of bacon grease kept in my fridge. I grew up with bacon grease and introduced it to my dear hubby! A few things we use it for is: Eggs, green beans, gravy for biscuits & gravy, red beans & rice, corn bread, cast iron skillet & much more! Bacon grease is that hhmm it needs a little something seasoning! Growing up we used these specifically for tomatoe soup but now I love them on tossed salad. I keep a little jelly jar of bacon grease in the frig. and use it frequently. The wild birds love it with peanut butter, cornmeal,bird seed and sunflower seeds. It makes a great homemade suet for the winter months. We don’t eat enough bacon though, thus the little jelly jar! I’m always running out! My grandma always made oatmeal cookies with bacon drippings and I continue to do it that way. People always make a gross face when you tell them what makes the cookies so good, but they can’t stop eating them! My hubby saves bacon grease solely for making popcorn in the Whirley Pop. He and the kids swear by it! Ok, I’m a little late to the party, but I didn’t see anybody mention popcorn! I always keep bacon grease, as learned from my dear mom. The number one use in our house has always been to make popcorn! It gives the BEST flavor and needs less butter and salt as a result! Equal parts grease to kernals in a heavy, lidded pan. Try it NOW!! YES!! Love frying bacon in the mornings and then frying potatoes and onions in the grease. I don’t buy the whole “It’s Not Good For You” thing. My grandmother cooked with bacon grease, ate bacon, cooked with lard more often than not and she just passed last Fall at 107 years old. She didn’t have a heart condition, okay it wore out finally, but not due to her diet. Another forgotten use for bacon grease…dry hands. I realized this a few months ago when I was cleaning dishes and the night and day after I washed the bacon pan my normally dry hands were really, really soft! It didn’t hurt that my hands smelled like bacon either, especially after taking out the trash! Bacon grease is great on toast instead of butter. I never seem to have enough bacon grease. I find myself buying bacon just so I can have the grease. I cringe when I hear that some people throw theirs out. Sinful. I use it in so many dishes. Fried cabbage and fried corn are favorites. Also, breaded tomatoes (canned tomatoes with sugar, bacon grease, s&p and torn bread. oh, you are my kind of new friend. 🙂 I have never tried breaded tomatoes (is that something I should admit?). It sounds amazing for summer when I have too many in my garden. Can you share the exact way you make it? I’d love to try something new. @Jen, Breaded tomatoes is basically pouring canned tomatoes and their juice into a saucepan with some salt & pepper, a little sugar & bacon grease and bringing to a simmer. Tear up some bread (stale bread works good) and stir it around in the tomato mixture. Done! This is really good served with a pot of beans. @PammyJo, Bacon grease is also good in macaroni and tomatoes. I am not one to cook bacon often (I am one of those weird not-a-bacon-lover persons) but I will make it occasionally and always save the grease. My favorite way to use it is to melt a bit like oil and then toss potato wedges in it before baking for amazingly crispy steak fries. Like my mom use to do, I always have a jar saved. Just pinned a wonderful recipe for ginger snap cookies using bacon grease. They were amazing!!! HOME MADE TORTILLAS ARE WONDERFUL WHEN REPLACING LARD WITH BACON GREASE . Fry chicken in 1/2 veg oil and 1/2 bacon grease. Best fried chicken you’ll ever eat!!! Oh my – my mouth is now watering. The best flavor for a roast is after flour, salt and pepper is to brown the roast in bacon grease. Yum! Remember, the squeaky wheel and all that…..grease and other fats will keep door hinges from sqeaking, if you don’t have oil on hand. I love bacon fat, I discovered it about a year ago. I switch out some of the fat called for in the recepies for bacon fat. first I put some of it into my flour tortilla dough, wow it gave my tortillas an amazing flavor. Then I tried it in My biscuit dough, exellent. It gives my biscuit amazing texture and flavor. Then I tried it in Apple pie crust, exellent flavor and texture. I loved your article. I thought I was the only person doing it. I also use Lard. But some times I don’t want to tell people I do because they thin it is un healthy. I think moderation is the key. I bet using a bit of it in pie crust would be amazing!! Thanks for telling me. I will have to give that a try too. 🙂 And yes, it’s all about moderation, for sure. I use bacon grease when making flour tortillas instead of lard. I always add it to home made mac n cheese and mashed potatoes! Yum yum yum! I never knew you could actually make cornbread without bacon grease until I lived overseas where bacon was tough to get! Mom kept hers by the stove in a metal canister made for grease with a strainer inside it. Bonus is it is a natural fat! HA! Linda, that is so funny. Since I wasn’t raised in the south, cornbread wasn’t something I made and when I did, it was from the box. Now, I’m so glad I know the “Secret” because it makes all the difference.